At the end of last year, I started to see tons of ads for Disney’s “DisneySide” campaign – this notion that everyone, regardless of age, has a side of their personality that’s influenced or personified by something Disney. These days, what’s considered “Disney” is so incredibly broad that it encompasses not just the characters made famous by Walt but also incredible acquisitions that have their own fan bases and fandoms (such as The Muppets and Marvel). Even people who are fans of shows on ABC or of watching countless hours of ESPN networks (*raises hands*) are showing off their DisneySide as they do so, since Disney claims both network conglomerates as part of their media empire. And so, when I was asked to show off MY DisneySide, it was hard to come up with just one thing. As I noted in a prior post, about getting Disney Fever, I was asked to host a party. OK, twist my arm. And the party was about showing off your DisneySide. No, seriously, what’s the issue here? And then they sent me a bunch of swag to have and to share. Are you kidding? Are you making this up? These nice people at MomSelect and Disney were kind enough to offer up all sorts of things to help host the party, so with that, I offer up the following disclaimer: I received free products in order to host the Disney Side @Home Celebrations. As with every other post on this site, all of the opinions expressed here are very much my own. The free products included a very cute American Tourister bag for me and party supplies, t-shirts (for a decorating game), and party favors for my guests. This party was sponsored by MomSelect and Disney Parks and I greatly appreciate their including me! Now with that out of the way…let’s talk about the party, shall we? Time for a #DisneySide @Home Party! This lovely party kit came filled with all kinds of goodies: Ocean Spray Craisin boxes, Disney decorations (tons of Mickey, natch), white t-shirts from Hanes – along with fabric markers – so we could have a t-shirt decorating contest, a thick stack of HP photo paper packages, lovely Minnie & Mickey prints, RunDisney bracelets and window clings…just so much stuff it was amazing to dig through it all. The first order of business was to find 10 kiddos. Thankfully, I had a headstart with my own two, so I contacted some friends and encouraged them to bring their kiddos over to join in the fun! Then, it was a matter of figuring out the food and party favors. Sure, I got some stuff from the celebration kit MomSelect and Disney Parks sent over, but that didn’t mean that had to be ALL that I gave my friends! The favor bag issue thus settled, it was time to get down to the food. I really wanted this party to have a cohesive theme – and so many of the other #DisneySide @Home partiers really had some amazing party themes going on. There were costumes and food and games and things and stuff and I nearly hyperventilated at the thought of it all. And then I had a moment of clarity: why not just celebrate all the things we love without worrying about sticking to one thing? To that end, we went with the theme of “A few of our favorite things”, meaning: anything and everything we liked was totally fair game. I even set up a Pinterest board just to track the ideas I found…most of which were too complicated to do in the time I had (but still totally worth pinning). 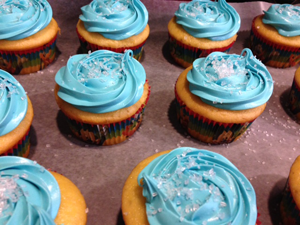 With that, IN went the Sofia the First purple party mix and IN went the Frozen cupcakes and ON went the nail polish decorated to look like snowflakes and…oh, of course I had to get in on the action. Why would I let an opportunity like this pass me by? Being the non-selfie-taking person that I generally am, there is no photographic proof of my outfit, but let’s just say that I was the walking embodiment of the theme. 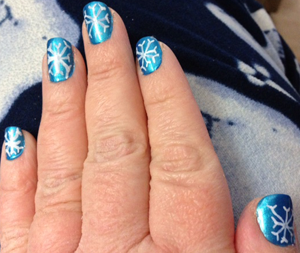 Sporting a Marvel t-shirt, sequined Minnie Mouse ears, and my “Frozen” nails, I did what I could to hold up my end of the bargain. Sofia the First…I’m finding out what sugar shock is all about….! In Summer? Nah. How about “In Mah Belleh”? Of course, it wasn’t ALL sugar. We also put out what we termed a “Hundred Acre Wood Veggie Mix” for fellow Winnie the Pooh fans who wanted something to counteract all of the glucose on the table: celery and carrot sticks, pepper slices and cherry tomatoes. Somehow, I managed to forget to put out some of the food I’d bought (like tortilla chips), but the kids effectively plowed through what was out, so it didn’t seem like more was needed. 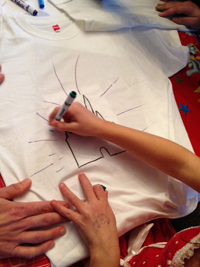 When it came time to get into games, we dug into the items from the Celebration Kit: namely, the t-shirts/fabric pens and a Disney Parks Bingo game. 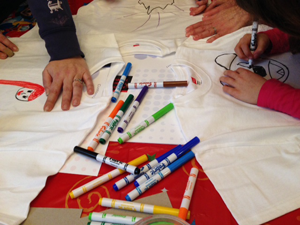 First, we had the kids make up their own t-shirts, some using stencils that we made from pictures we found on the web, printed, and laminated for sturdiness, and some free-handing their own ideas. 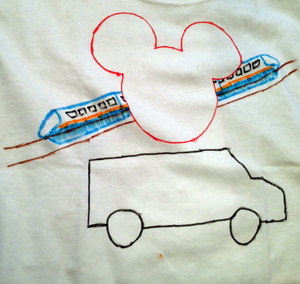 DS was all about having a train of some kind, so when his designated artist (dh) got into the mix, a monorail appeared on his t-shirt. 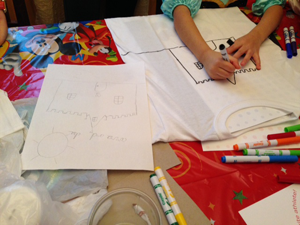 Another party goer free-handed a castle with fireworks on a spare sheet of paper and then transferred her drawing to her t-shirt by layering the paper inside the shirt and tracing. Brilliant! The kids then voted on their favorite design, and the winner won a Little Mermaid Disney Golden Book I’d picked up at the grocery store. When we did the Disney Parks Bingo, all of the kids had similar cards, so I was biting my nails wondering if I’d have multiple winners. Luckily, only one winner yelled out BINGO – and he won a Cars Disney Golden Book I’d picked up at the same time as the other book was acquired. By the time we made it through Disney Parks Bingo and the kiddos all got cupcaked-up with the “Frozen” confections, the party started winding down. After all, what’s better than giving kids sugar and then sending them home with their parents? A good time was had by all, and each kiddo left with a favor bag, a Minnie/Mickey print, and a balloon (another thoughtful inclusion by the folks at MomSelect and Disney Parks), and one family even left with plans percolating for their own Disney World trip (which they just took!) 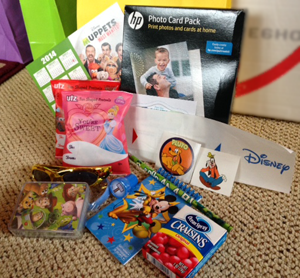 – fueled partially by the Disney Parks informational DVD included in the celebration kit. I’d be jealous if it weren’t for the fact that we have our own Disney World trip on tap…my first visit to the Magic Kingdom in Florida! This post would have gone up MUCH sooner had it not been for the Adventures in Strep and rather incredible work schedule that have put me on the brink of exhaustion for the better part of the last four weeks…but I had to get it out so that I could share how much fun we had. Again, I’d like to thank MomSelect and Disney Parks for their generosity in including me in this #DisneySide @Home campaign. I had a lot of fun at the party, and the smiles on the faces of the kiddos were just wonderful. Even better, and proving the point further, the adults had lots of smiles and laughs, too. You don’t have to be a kid to have a #DisneySide. I think you just need to remember that spirit of fun, of play, and the belief that dreams can come true. 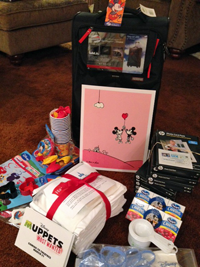 Disclaimer (encore): I received free products in order to host the Disney Side @Home Celebration. The opinions expressed in this post are mine all mine. No animals were harmed in the making of this party. Kristoff may or may not be right that all guys pick their noses. 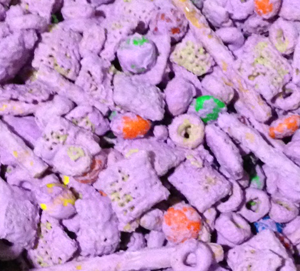 And kids – don’t try this much sugar at home without a parent and some vegetables. Seriously. We really only get to do one BIG family trip a year, and this was the year that dh and I decided we’d want to take the kids to DISNEY. I kinda feel like you have to go capslocky when it comes to DISNEY because of what DISNEY represents to me: fun, family, a sense of wonder, and something for kids of all ages. I’ve been a fan of DISNEY movies since I was very small, but the one and only time I’ve gone to DISNEY was when my parents took us to Disneyland on a trip to LA nearly 30 years ago. We’d kept the trip under wraps, so we had to come up with a big unveiling. In this case, DH took a page from the same book his mom used with him and his brother: putting the message on a puzzle. I got a 25-piece magnetic puzzle from Target, and dh wrote a message on it announcing the trip, and then we hid the pieces. Four baggies with 6 pieces each were stashed around the house, with the 25th piece wrapped in a box and placed under the tree with a clue that led the kids to the first bag. Each hidden bag had a clue that led them to the next, and when they’d collected them all they put together the puzzle. Naturally, the kids lost their nut when they found out we were going to DISNEY, and once I was able to take the two guidebooks we bought out of hiding, dd threw herself headlong into learning everything she could about the attractions and events. Needless to say, the kids are extremely excited, and I have the feeling that this will be probably the best trip they’ve been on yet. We wanted to wait until we thought they were old enough to remember it and enjoy it. Since ds is turning 5 this year, he’s old enough to get it – and dd (who’s 7) has been on our case for several years to get to DISNEY, just like all of her friends. It was exhausting trying to find a hotel that would work for both family’s myriad needs, but once we did, it was easy as pie getting our booking done over the phone. We’ve since been customizing pieces through the My Disney Experience part of their website and researching through the guidebooks we’ve acquired and the Disney website. And so, it was with great surprise (and excitement) that I opened the email saying that I was picked to host a #DisneySide @Home party. I have a box that weighs nearly as much as my four-year-old coming to my house, packed with some amount of swag and party supplies, and I get to spend time with friends squeeing about DISNEY and showing off my “Disney side” (easily seen in the part of my personality that has NO shame or self-consciousness about walking around wearing dd’s sequined Minnie Mouse ears). Mind you, I’m not someone who has gotten numb to any of this. I know people who’ve been to DISNEY so many times that they talk about it like they’re going to just any old amusement park. Honestly, I never want to go to DISNEY so often that it loses its magic for me, although A) I could never afford that, especially since we don’t live in Florida, and B) I don’t understand how you could lose appreciation for all that magic. Then again, I’m the kind of person who appreciates it when a hotel has bath sheets instead of cheesecloth squares posing as bath towels, so there’s that.